inHarlem: Kevin Beasley, Simone Leigh, Kori Newkirk, Rudy Shepherd is the first in a series of artist projects that take our institution beyond its walls. Each of you has made a work that is public by its very nature, serving as a catalyst for shared experience within Harlem. 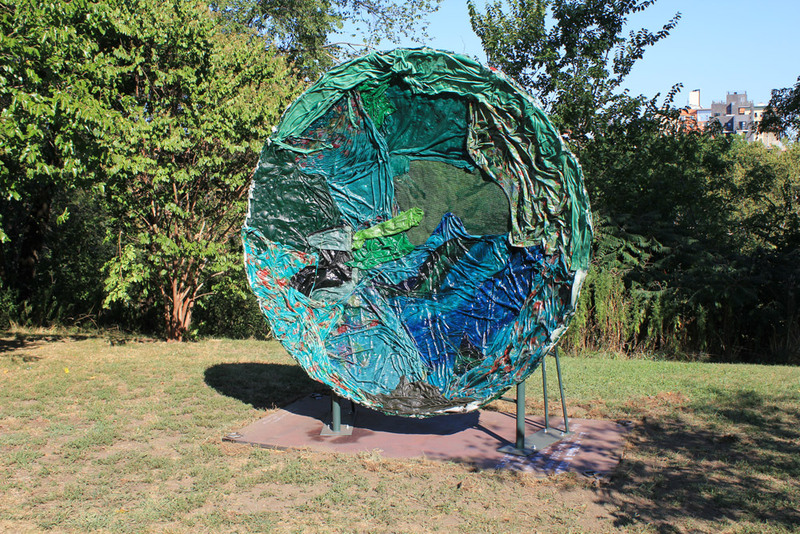 How do each of you feel about the role of public art as it functions in your own practice? Kevin Beasley: I am always grappling with the distinction language provides between a public and private experience, and am always interested in how a work is contextualized. As an artist, it is important to consider your process and the outcome of the work as affective to some kind of community. My work always has traces of a public. I like to think I can bring the public into my studio while simultaneously addressing its populism if I must. If this kind of symbiotic relationship can exist more frequently between institutions, the artists and the general public then I think the possibilities can be expanded. Most public art, in my opinion, just isn’t as challenging as the work I find in museums and galleries, and I hope to see that change. Simone Leigh: Although this is my first public art installation, it is not the first time the Studio Museum has supported me to expand my practice. During my 2010–11 residency, I began using a mold of a watermelon to make large cowrie-like sculptures for my installation, conflating these American and African objects and their meanings. I still work in this way, using forms that are disparate to create hybrid meanings. Kori Newkirk: I like to think that most, if not all, art is public, or at the very least has some sort of public life. Obviously this is not always the case, but I like to think that way. I tend to think about this "public life" of art works often when working, looking and thinking—in the studio and beyond. I don’t make things to keep for myself. The goal is to get them out in the world and away from me. Rudy Shepherd: Public art has been central to my work almost from the beginning and is something I have thought a lot about. I love that public art takes the work and the artists out of the safe, familiar confines of the studio and gallery/museum space and puts them out in the world with regular people. I have always had an interest in communicating with people in a direct way, and working in public seems like the best way to do that. It strips away the barriers some people feel to entering art spaces and brings the work and ideas directly to them in a space where they feel comfortable. I didn’t have the privilege of working with each of you until the final stages of the project, once we started fabrication and installation, so could you talk about your process for the commission from the beginning? SL: After I went to Zimbabwe in 2010 I began thinking about traditional African architecture, particularly these buildings I had seen behind the National Gallery at the time. These were on my mind when I received the Studio Museum commission. Gemme Rodi, an art historian, had also recently shown me some photographs of these stunning kitchen houses in rural Zimbabwe, so these things were percolating. The subject became the kitchen houses, known as imbas, which are traditional structures built by the Shona-speaking people that have a lot of symbolic, ritual and cultural significance. Collaboration is an important part of my practice, so in approaching this project, my first architecturally scaled work, I consulted with the architect Maxwell Matanda. Unfortunately, I couldn’t make a sculpture that had interiors in a park because it would become a dwelling, so I started to play around with the conundrum of not having a window or a doorway, or access to the inside. 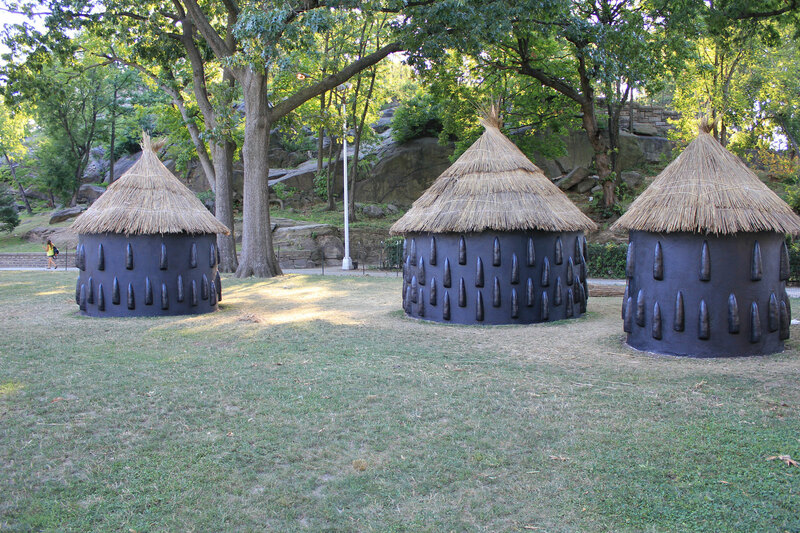 The surface of the imbas in the installation is actually my mimicry of the texture on the extraordinary Mougoum Teuleuk in Cameroon, and the roofs were made with a system that is used in Burkina Faso. So this sculpture is very hybrid. KN: This opportunity was a bit different for me. I was approached about translating something very specific for this project. A classic burden-and-privilege situation . . . which took some pressure off and applied even more pressure as compared to working from scratch with a specific place or idea in mind. I can say that some things changed in the process, mostly when it came to materials, but the underlying structure of the work remained constant. RS: This first part of the project for me was choosing a site. I chose Jackie Robinson Park because of the time I spent there at a seminal time in my life. When I split up with my first wife I moved to the Dunbar Apartments around the corner from Jackie Robinson Park and would bring my kids to the park and the pool on the weekends. Somehow it feels good to put a Black Rock Negative Energy Absorber there to neutralize the negative connotations of that time and make space for a new experience there. Turns out it is a highly used park and I ended up spending much of my time on the site talking to local residents about my project in a very engaged way. Kevin, your installation Who’s Afraid to Listen to Red, Black and Green? inhabits a charged site. 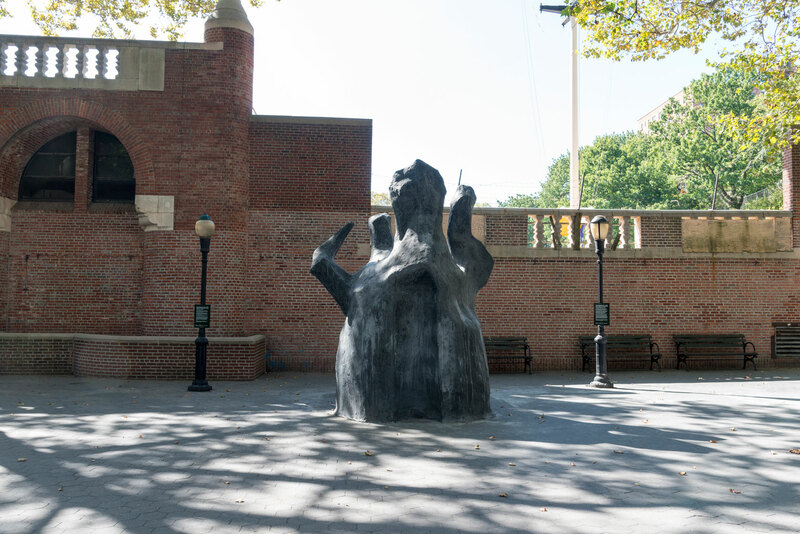 Situated in Morningside Park, effectively the boundary between Harlem and Morningside Heights, the three sculptures stand in a place where racial and neighborhood tensions have long played out. How do you see your work responding to this history? KB: I feel like the primer was the Studio Museum extending their reach to the park to begin with. That was the first act of reclaiming the understanding about the park and its history. My approach in making work is often centered on the idea of focusing and/or questioning yourself when experiencing it, so naturally it made sense to refine those intentions through aesthetics. The color choice felt like a simple gesture that in this context becomes a question about the symbolism of those colors and what they mean to those who encounter them. For me there is definitely a question about representation. Unless you have synesthesia, no one is hearing a color when they go to that park, but when one thinks about what those colors represent then that becomes a much more charged and difficult space to exist in because it refers to the tension and troubled relationship between the black and white communities. Simone, the connection between a particularly elaborate imba yokubikira and the park’s namesake, Marcus Garvey, really resonates. Garvey’s advocacy for Black Nationalism, particularly the building of an independent nation in West Africa for black Americans, speaks to the celebration of and concern for the diasporic communities you address in this work. Do you see Garvey’s legacy adding another level to the work at all? SL: The setting in Marcus Garvey Park was very important to me. I wanted to make a Pan Africanist gesture through the work while also thinking about the changing demographics of Harlem, which has become the home of so many people from various African countries. St. Nicholas Park was designed around the rugged landscape of northern Manhattan, making it the most geographically varied and leafy of the four Historic Harlem Parks. Kori, the steps that anchor your sculpture were once indistinct and overgrown, but now you have given them new life. Can you talk about your relationship to found materials? Did this shift in scale, from your domestic-sized curtain works to this monumental sculpture, change the subject at all? KN: Found materials do play an important role in my work, or rather material concerns are super important. I spend a huge amount of time working out the materials and their meanings and just trying to figure out the what, where, how, when and why of the material things that might or might not go into a work. It’s a laborious process but it really drives a lot of things going on. The increased scale had never been a question. While Sentra is visually related to my beaded curtains—in its horizontality and some basic formal considerations—it is about completely different things overall. Like a lot of my work, it aims to speak about place and the body, but there is so much more that can be thought about and understood from viewing this work in this location at this time. Although you live in Los Angeles you’ve said that you don’t necessarily identify as a Los Angeles artist. How has working on this piece then, since having your major exhibition at the Studio Museum back in 2007, renewed your relationship to Harlem? KN: There was a time when I felt that the "L.A. Artist" moniker was a bit more restrictive and spoke about a certain type of artist with certain types of artistic concerns. That was not the reality in my studio, and while I have been living and working in California for over two decades, my relationship with New York and particularly Harlem has remained strong as ever. Rudy, this is your fifth Black Rock Negative Energy Absorber. I think it’s great that the work is in Jackie Robinson Park, a place steeped in efforts to bring the community together. 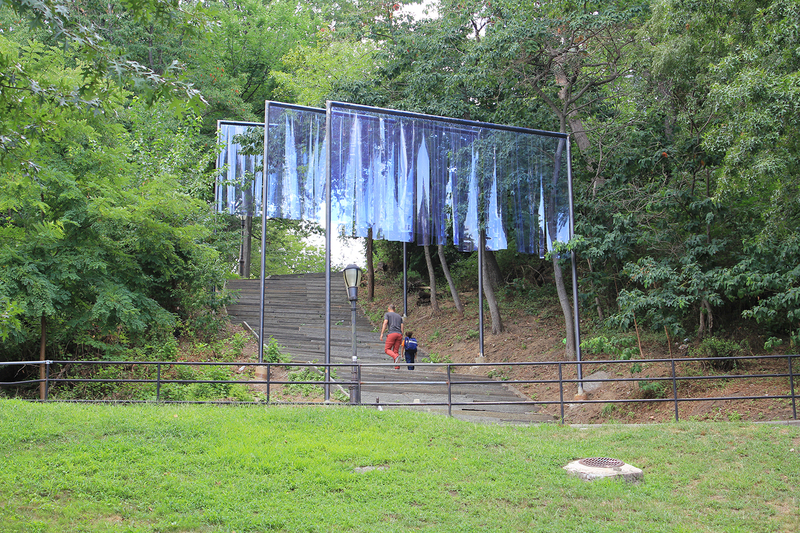 How has it felt to have this project in Harlem? Have you observed any remarkable interactions with Black Rock? RS: The first thing that comes to mind is the overwhelming amount of dialogue I had each day while working on my sculpture in the park, from people walking their dogs each morning, to kids hanging out in the park, to folks that work in the park in different capacities. Everybody wanted to know what I was doing and why. I had people filming and photographing me. I met many local artists, musicians and actors, and I was challenged by each with the fact that I was not working in my quiet studio alone. This was something else—I was in someone else’s space, a communal space used by many different people. It was fun to see how people reacted to my ideas and I was happy to be understood and appreciated. Though one kid did tell me she thought the title of the piece was too long! Black Rock follows a series of smaller “Healing Devices” you have made, sculptures that make formal and magical analogies to ancient artifacts. Can you talk about the progression of this work? RS: There are three major strains in my work right now: a series of drawings that chronicle things happening in the world such as the killing of black men by police officers, the Black Rock Negative Energy Absorber sculptures and Healing Devices that offer up a spiritual solution to these seemingly vast, unsolvable problems, and the Healer performances that articulate my emotional response. They link together to create a gestalt that represents my opinion on the state of the world today. It serves as a historical record of a black man living in America in 2016 in a way the history books or the Internet never will. It represents not only the things I am seeing, but also how I feel about it and how I would like to see it change. There are plenty of people that will organize marches and write legislation to try to fix these problems, but I believe it is the artist’s job to articulate the problems of the world they live in and bring them alive for people to feel, to open up dialogue and create a space where people feel safe discussing theseissues without feeling like they have to be an expert to have a voice. During the construction of my project at Jackie Robinson Park I had many discussions with people young and old, rich and poor, about the state of the world right now, and for me that is what it’s always been about.